Hello! I’m Rochelle from Lucky Lucille, and today I’m super excited to share two of the most gratifying garments I’ve made in a long time. Though my original plan for these fabrics is the polar opposite of what I ended up with, everything worked out for the best. I don’t know if it’s the recent snow storm we got in NY or the fact that cold/flu season seems to have found its way into my household in lieu of Spring, but I had a momentary lapse in judgment when planning my projects. 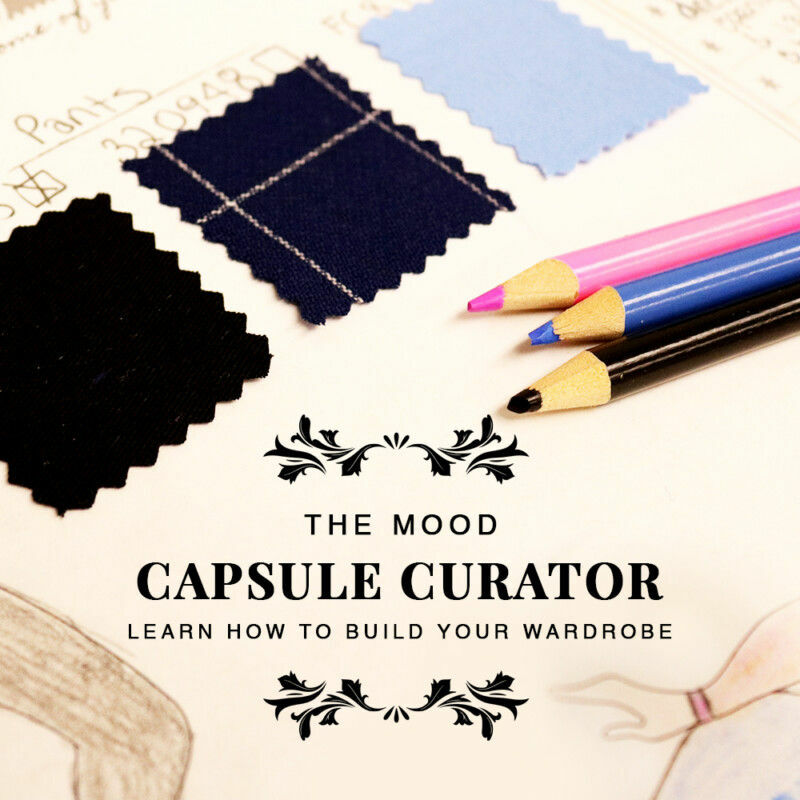 I’ve always associated Mood Fabrics with high fashion, designer apparel so I really wanted to create an impressive outfit worthy of that description. Well sometimes, as they say, you don’t get what you want but you get what you need. Sure, the trendy blazer and dress combo I had in mind when shopping for fabric would have been super cute for special occasions, but what I really need in my wardrobe right now is comfortable, quality basics that I can live in and wear all the time. I’m SO inspired by high fashion garments but, as much as I may want to, I can’t fit them into my lifestyle. I’ll be the first to admit I’m easily distracted when it comes to fancy sewing patterns and pretty fabrics. I’m like that squirrel who collects shiny things and has no idea what to do with all that acquired “treasure”. I’ve sewn a lot of beautiful things in the past that I never wear and I don’t want to be that squirrel anymore! The more I sew for myself, the more I learn to treasure and appreciate the simple things. I’m finding beauty in basics like pullovers and comfy shorts. 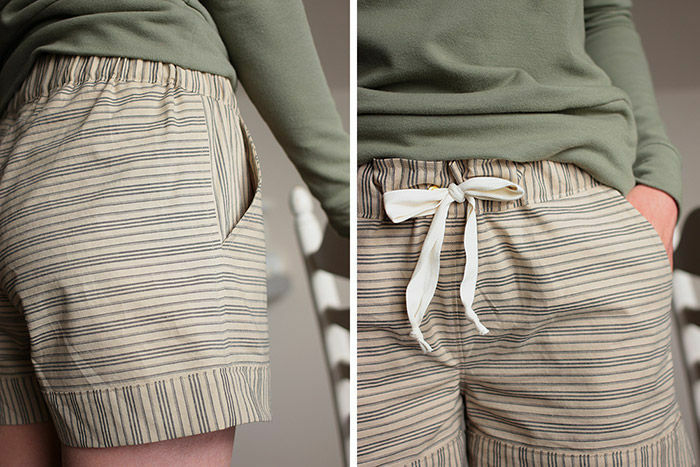 Sewing for myself allows me to get the sizing just right and pay attention to small details like matching stripes. 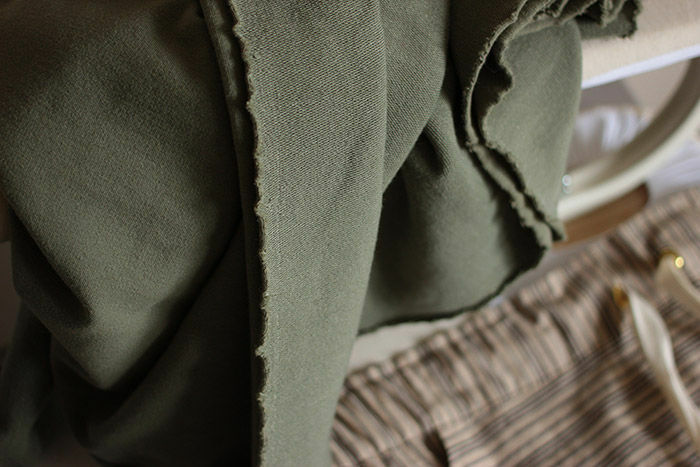 I can invest in higher quality fabrics when I sew for myself, too. These are the types of garments I need to start acquiring. The fabrics I picked for this outfit are a striped cotton/linen shirting (or in this case, it’s cotton/linen “shorting” – ha!) 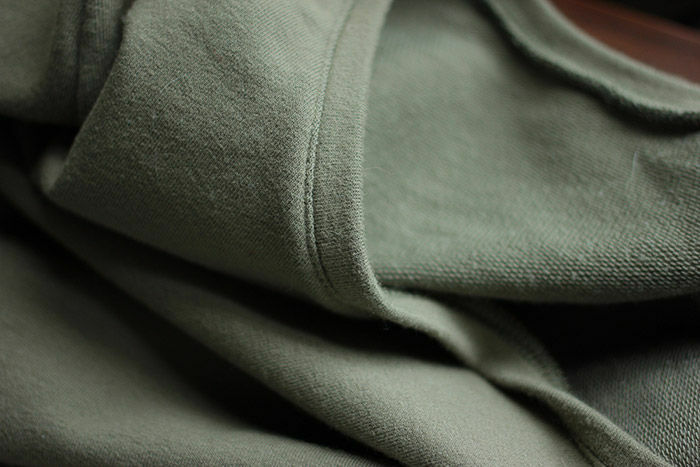 and an olive rayon blend jersey knit. The jersey is a heavier weight with great drape and stretch, perfect for loungewear! The cotton shirting is exactly as described online, nearly opaque and very soft. Both fabrics were wonderful to sew with and I’m already pondering other projects as an excuse to buy more! As for the patterns, I picked two indie favorites and made small modifications to each. 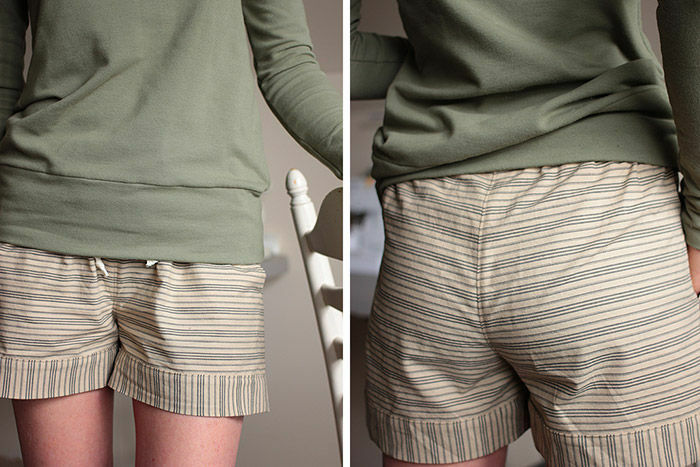 The top is Lark by Grainline Studio, and the shorts are Carolyn by Closet Case Files. 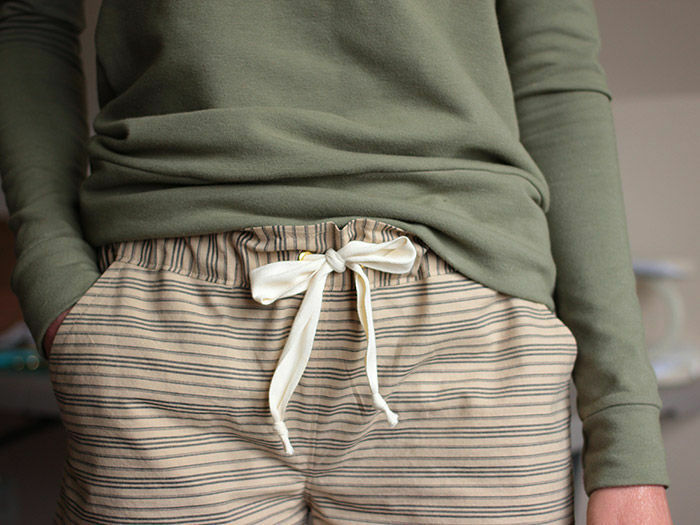 I added cuffs to the sleeves and a wide band to the hem of Lark for more of a sweatshirt vibe, and my Carolyn shorts are sporting a drawstring at the waist instead of plain elastic. Playing around with directional stripes gives my inner squirrel just enough “ooh shiny!” action to be satisfied with such a simple outfit, but if you ask me, easy to sew equals easy to love. p.s. If you’d like the opportunity to win $50 to put towards your own wardrobe basics (or wardrobe fancies! 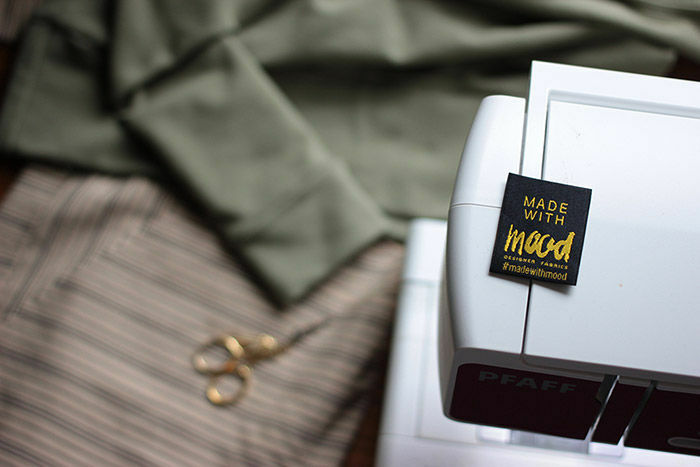 ), check out the Mood Fabrics giveaway on my blog. Your stripe matching is PERFECT!!! Very pretty 🙂 I love the colors on you and the stripes on the shorts! These are lovely garments, and I agree, sometimes you just need the basics – but good basics. Well done.